The deputy commander of the Islamic Revolution Guards Corps (IRGC) said that the Islamic Republic has expanded its soft power and hard power across the region by creating an “international Islamic force” from different nations. “Today we have crossed geographical borders and entered the enemy’s strategic field. We have brought an extensive geographical area under control and have repositioned the battlefields to distant regions. And this is the expansion of the revolution,” Brigadier General Hossein Salami told a gathering in the northeastern city of Mashhad on Thursday night. “Today in Lebanon, a power called Hezbollah with a revolutionary identity has taken shape that can establish equilibrium in the political arena and on the field in the eastern Mediterranean,” he added. “When the Zionist regime sees the manifestations of the presence of this power and hears different dialects from Pakistan, India, Yemen, Iran and Afghanistan, it realizes that an international Islamic power has taken shape close to its borders and that America and Europe are unable to prevent its expansion.” He said Iran and its allies emerged victorious over the U.S. and its regional allies in Syria. The IRGC commander also ruled out negotiations with the United States over the country’s ballistic missile program or regional policies. He predicted that Washington would not resort to waging a war against the Islamic Republic because it would harm the global energy stability as, he claimed, Iran controls energy resources and routes in the Persian Gulf. Comment: Salami’s remarks come at a time when tension between Iran and the United States and its regional allies have reached a new high. Israel has stepped up strikes against Iranian forces and their militia allies across Syria, increasing the risk of a major escalation, or even a direct confrontation, between Iran and Israel. Such a conflict would most likely draw in the United States as well. Now that the fight against ISIS is almost over, the rhetoric of Iranian military leaders and Iran’s regional militia forces have shifted predominantly against Israel and the United States. Since the start of the Syrian war seven years ago, Iran’s Revolutionary Guards have mobilized, funded, trained and deployed thousands of militia forces from across the region to fight in Syria to prop up the embattled regime of Bashar al-Assad. 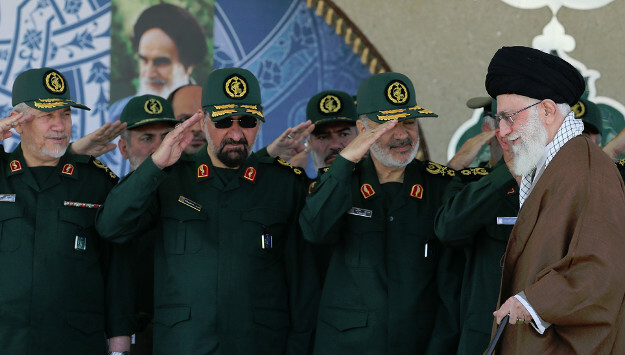 While the existence of Afghan, Pakistani, Iraqi and Lebanese forces in Syria are well-documented, Salami’s remarks indicate that the IRGC has recruited and deployed militia forces from Shiite communities in India and Yemen as well. On May 8, President Donald Trump announced that the United States was withdrawing from the nuclear deal Iran and world powers signed in 2015. He, however, pointed out that his administration would be willing to negotiate with Tehran for a new, more comprehensive deal that would not only address loopholes in the nuclear issues but also tackle the Islamic Republic’s controversial ballistic missile program and destabilizing role in the region. But Iranian leaders have categorically rejected any talks with Washington over a new deal. They have particularly highlighted that they would not negotiate the country’s missile activities and regional role even with European powers. When Secretary of State Mike Pompeo laid out 12 requirements in May for Tehran to adhere to in order to forge a new deal, Salami was among several top Iranian military leaders who rejected all U.S. demands, saying that Iran’s missile program or regional influence are not up for negotiation.